Meet the deceptive Citrine, birthstone for November | Is This Mutton? Who could not fail to love the bold, extravagant citrine in its flamboyant shades of yellow, orange and red? This magical gemstone is one of the birthstones for November. But first, some bad news about citrine. Those deeper yellow and orange shades may actually not be citrine at all! Citrine is rich in meaning and legends. It was known as "the merchant's stone" because it's supposed to help in acquiring, and keeping, wealth. Perhaps not surprising, based on its rich colours, citrine has health giving properties associated with the sun. It's said to stimulate the chakras like the sunlight of spring, clearing the mind and stirring the soul to action. The gemstone is also associated with urinary, kidney, and digestive diseases. It has been said that citrine purifies the system and may help counteract the toxic affects of many pharmaceutical medicines. Citrine is a transparent, yellow variety of quartz, ranging in colour from pale to golden yellow, honey or almost brown, and may contain rainbow or sparkle inclusions. The name comes from the French word citron, meaning lemon. It was used as a gem in Greece as far back as 300 B.C., and because of its colour, is sometimes mistakenly referred to as Gold Topaz, Madeira or Spanish Topaz. It's disappointing to learn that much of the commercial citrine on the market is actually heat-treated amethyst or smoky quartz. It's from these stones that we get the deeper amber or orange-reddish shades of citrine. Most natural citrine is a pale yellow colour, like the Tiffany examples below which I find extremely beautiful. 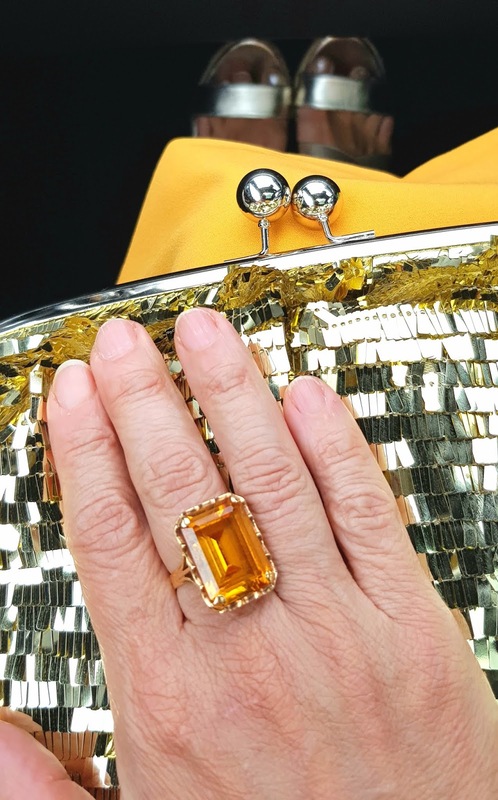 The ring in the top picture is my own - and it went beautifully with a dress the colour of egg yolk that I wore to a wedding this summer. I spotted the ring in a second hand shop in Cheltenham a few years ago, and love it. But it's probably not a real citrine. As explained above, natural citrine is very rare, as almost all the material offered on the market under that name is not natural citrine, but heat treated amethyst. It is found in good quality in Brazil, Madagascar, and Russia. A tiny number of locations in the Austrian Alps have yielded citrine. The stone is very sensitivity to heat which could make it change and fade into a lighter colour. You can use any commercial jewellery cleaner or plain soap and warm water (using a soft brush) to wash your citrine. Make sure you rinse and dry it thoroughly after cleaning it. In terms of quality citrine stands out amongst all the other yellow gemstones: tourmaline, yellow sapphire and yellow topaz. Citrine has a hardness of 7 on the Mohs scale, making it resistant to scratches and durable for jewellery. Citrine is suitable for use in any style of jewellery. As you can see in the shopping guide, it is often turned into extravagant rings, and it looks beautiful with yellow gold. I've selected a few pieces from well-known retailers, and I get a few pence if you click through. I would be more than happy to own any of these pieces!